John Brown believes Saturday's meeting between Hibernian and Rangers will set "a marker" for the rest of the season. 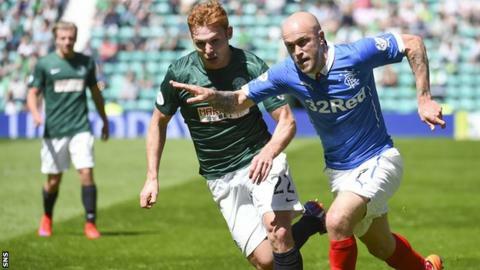 The former Ibrox defender sees the two sides as the main contenders for the Championship title, making the weekend Challenge Cup tie more significant. "It's a tournament that Rangers won't be too concerned about," said Brown, who played for Rangers from 1988-97. "They'll want to do well in it but the league is the priority and getting promotion at the end of the season." Brown urged Rangers fans to be patient as the Ibrox team develops under new manager Mark Warburton. Rangers lost 1-0 to Burnley in a friendly in Glasgow on Tuesday evening but Brown saw signs of encouragement in the performances of the six summer signings in the team. Goalkeeper Wes Foderingham, defenders James Tavernier, Rob Kiernan and Danny Wilson, midfielder Andy Halliday and forward Martyn Waghorn all played. Also in the starting line-up was Jason Holt, who played as a trialist but is on the verge of completing his move to the club after Rangers agreed development fee compensation with Hearts. "The signs were good," Brown said. "It's going to take time. I liked the players he's brought in. It might take six-to-eight weeks until they all start to gel. "The squad that Mark and [assistant] Davie [Weir] are putting together is very energetic. There are some good young players, the lad Halliday looks excellent in the middle of the park and I've always felt that he was a decent player. "He was brought up a Rangers fan and it's important that you have players who know about the club, like Danny Wilson, and you had a couple of experienced players coming on like Kenny Miller and Darren McGregor. "Mark will want to get strong players in to cover every position and he's probably short of that. I would imagine he will be looking to bring in another four or five players before the beginning of August." Rangers have also been linked with a move for Scott Allan, the Hibs midfielder who has one year left on his contract. The 23-year-old was an influential figure for Alan Stubbs' side last season and Brown feels the extent of Hibs' title challenge will be influenced by Allan's future. "[The] key is keeping hold of the lad Allan," said Brown, who expects Warburton to give youth a chance at Ibrox. "If Rangers could pursue that and get him he would be a big addition to the squad." Meanwhile, former Ibrox youth coach Brown and ex-Celtic captain Paul Lambert have called for clubs to provide more education for young players with only a small percentage making the grade as professionals and many of the rest unqualified to seek careers in other industries. "You've got to give them an opportunity," Brown said. "Clubs have got to look at providing a facility for younger players to pick up a trade outwith football. "Even when I was at Rangers, [players] had opportunities, they could go and do sports degrees at college, but it was once a week. Do you need to put more time into it? "Some players looked to further their experiences by doing degrees, but they came back to say that they couldn't fit in all the hours of studying with the coaching. "You need to look at their working week and clubs need to be not as selfish and look to educate the players so that they have something to fall back on if they don't make it." And former Aston Villa and Norwich City manager Lambert added: "If I had my career to relive again, I wouldn't change the football but I wish I'd had something to fall back on. "I just believed I was going to be a footballer, but that's naivety. At a young age, you don't realise what the world holds for you. I was fortunate that I had a good career."